I’m Suse. I live in Launceston, Tasmania with my husband, 6 year old daughter and 4 year old son. We live high on a hill with an amazing view of the mountains, river and sky. I love it! I started Black Eyed Susie when my daughter was just turning one. It has gone through a lot of changes since then as my life and the amount of time available to work on it has changed. It’s been a great way to have something for me in the flurry that life with small kids can be! I find making something tangible very satisfying. I was a microbiologist working in a laboratory before having children and I enjoy sewing so much more! I’m a gatherer and I love scouring secondhand shops for old pieces of furniture, vintage fabrics and crockery. I have a truly terrifying amount of fabric and yarn in my house! I’m currently concentrating on a range of cushions made using stunning fabrics. I always use great quality fabrics and closures and take a lot of care with cutting and construction to produce a product I’m completely happy with. I also have a range of vintage glass earrings that I really must finish putting on the site. My inspiration comes from all sorts of places. 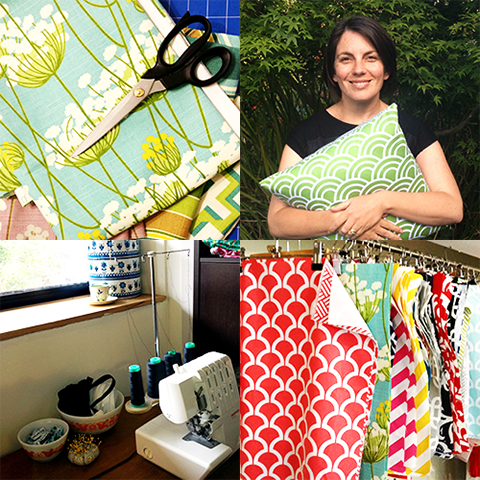 My home, my lovely friends’ homes, retro and vintage fabrics and good old fabric shopping. I tend to be drawn to bright, retro feel prints most at the moment in keeping with our house which is a 1960s red brick with huge windows and a mid-century style. My creative process is a little slapdash as I’ve learnt over the years to go with my gut feeling. If I spot a new fabric I love it will often lead to a whole new range. I have loads of ideas for new products but they will have to wait until both my children are at school. I’ve always tried to make things. I remember studying my Mum’s macramé book as a child and trying desperately to make things. I spent a lot of time thinking about how to make things – I still do! Mum knitted and sewed a bit but I think I have a much stronger urge to make than her. It must be in built, I watch my daughter now and she’s exactly the same. I used to sew clothing items for myself fairly regularly but I got serious when I was pregnant with my daughter. That time coincided with the online crafting world booming and I found many inspirational blogs. I left my job and started studying again but was trying to work out what sort of craft business I could have. Black Eyed Susie came into being when I started sewing for my daughter and decided to try selling some girl’s clothes too. This was around the time Made It began so I’ve been with this site almost from the start. Since then I’ve made loads of kid’s clothes, bibs, hair accessories and baby shoes. The list goes on! Inevitably, as my kids grew up I became less interested in making clothes for young children. The cushion range came along quite by chance and grew so quickly that I found I didn’t have the time to continue with my other products. Concentrating on one area for the moment lets me be more streamlined and organised and leaves me more time to spend with my family. Gosh, I don’t even know! It came from the song and the flower and to be honest, once I had it in my head I couldn’t think of anything else. The fact that I’m a Susan fitted well and it seemed right for a kids clothing range. It may not be such a good fit for cushions but I’m very attached to it now. My current non-sewing craft obsession is crochet. I’ve used lots of online tutorials and the help of members of a local craft group to learn, find patterns and information. Ravelry.com is a great resource for this. My friend’s crafty projects are also very inspiring and pinterest is also great. Every so often friends and I will have a social crafting session with a bottle of wine and that always inspires me to start something new. Don’t feel like everything about your store needs to be perfect before you start. Just get a few listings up and work on improving your photos, description and branding as you can. I still have quite a few products that I want to improve the photos for. Don’t be disheartened if things don’t sell straight away. I remember when I listed my first things online years ago I was so excited and nervous I couldn’t sleep that night. Of course, nothing sold that night and it took a few weeks for me to make my first sale. I find it really worthwhile to take the time to send customers a quick email to let them know their item has been posted. If it’s going to take a couple of days for the item to be posted let them know. Your customers are your most important asset and providing great service is vital. A good experience can lead to buyers returning for more, telling their friends and family or leaving great feedback. Also, it can be a bit lonely working from home and so I find it lovely to connect with people too. I use Facebook a lot to promote sales and direct buyers to my Made It shop and I also try to list new items regularly. I’ve recently begun restarting items occasionally and this seems to be working really well. I’m just beginning to experiment with paid advertising but my tips are to be sure that the product/s you will show in your ad fit the publication’s demographic well. Remember that advertising is not always about the sales that you make straight away – it’s also about getting your name out there so that customers may come back later. Don’t under-price your items. I did this for a long time and tried to wholesale too. It’s very tempting to try to keep prices as low as possible but to build a sustainable business you have to take into account the full cost of making your item including materials and your time as well as the time it takes to do all the little admin jobs like checking emails, purchasing, packaging, posting and bookkeeping. The more you sell the more time you need for all these things. You can end up getting burnt out working really hard with no time left for your family for a minimal income. It can be very easy, especially when you are working away at home on your own, to become so familiar with your work that you forget how lovely it is. I find it helps me to try to see my work through other people’s eyes occasionally. This can be through verbal feedback or just seeing them in someone else’s home. I love spending time with friends and family, camping, bushwalking, running on the bush tracks near our house and going to my mother-in-law’s beach shack. I also love having breakfast out and I do enjoy a nice glass of bubbly! I don’t seem to watch much tv or films these days. I seem to be limited to watching Rio and Curious George over and over and over. I love The Stoneroses, Gomez, Gotye and Kimbra at the moment. I love reading Kate Atkinson novels, and travel writing and my favourite website is, of course, Made It! Hmmm, breakfast at a great café with my family (preferably in France or Italy! ), followed by a cruisy bike ride through villages to a patisserie for morning tea, a bit more leisurely bike touring followed by a long lunch and then finding a nice village with a lovely little hotel. I’ll be waiting a long time for this! Ginny Reynders - I absolutely love my cloud necklace from GinnyReynders.